Retirement should be something you can anticipate with pride, not something you fear facing. At Retirement Security Centers we seek a partnership with those we serve to create an atmosphere of empowerment that breeds confidence, and builds success. Our proprietary EASE Process has been built over decades and is the compilation of years of first- hand experience guiding our clients through this life transition. Simultaneously we are constantly staying abreast of the beneficial changes in legislation, policy and product offerings that can impact those approaching or living in retirement. 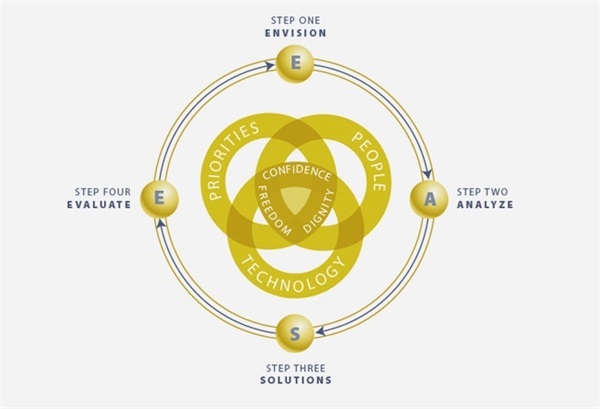 Our four step approach is intuitive by nature, combining your priorities and the people most important to you with the power of technology to create the financial freedom, confidence and dignity you deserve. Imagine the future. Define your ideal. In this first conversation of our process we seek to understand what the most critical issues are for you and your retirement. We then help define your vision, simultaneously refining the financial dynamics that will impact that vision. We integrate this information into our "life planning" efforts with you. We begin to categorize core, joy, goal, and legacy expenses and match them to your assets and income sources for a complete portrait of your financial situation both today and in the future. Visualize your alternatives. Participate in the process. This customized, interactive financial planning session incorporates insights and data from our previous meeting with cutting edge technology for financial visualization. Together we’ll consider choices, play out scenarios and weigh financial options, applying them to your personal situation. Consider your options. Control your future. In the third step of the process we provide you with our recommended strategies and solutions. We provide professional guidance to support your choices and answer all questions you and your family might have before taking action together. Review reality. Adjust as needed. Each year we will review your actual progress and results from financial health and life circumstances to personal goals, so that we remain aligned with you. As your life changes we will adapt your plan so we can accommodate your evolving needs in an appropriate and expeditious manner.